Shy Jessie and outgoing Annie seem opposite types, but they are drawn to each other for different (and largely unspoken) reasons. Jessie needs Annie's strength to survive the bullying at school and a smothering mother who aggravate her panic attacks. Annie's confidence belies the loneliness she feels living with a stepmother and a largely distracted father. And she longs for the close family world of Jessie's home. When Annie befriends Jessie's tormentors, the two girls are driven apart and these unspoken agendas aggravate the division. Jealousies and betrayals ensue, which are lent drama by being told in alternating narratives. 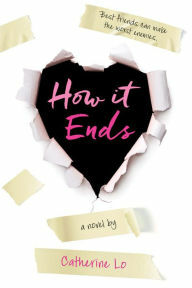 A relationship story, this is quintessential chick lit, but I still enjoyed it. It veers about a bit and there are some loose ends (the girls' relationships with their mother/stepmothers and Jessie's abuse of prescription sedatives, in particular) that I would have liked to seen reach some sort of closure. There's also an abortion clinic scene that, while powerful and interesting, felt a bit tacked on to the story. I was happiest when the girls were just talking with each other. Their conversations felt real and the relationship complex and authentic. Lo has a very good sense for how friendships work and the way that people give and take. I also found that Lo's description of Jessie's panic attacks resonated with me quite vividly. Overall, this is an insightful and enjoyable read.